Data acts as a veil, a sort of overarching condition that results from and drives our interactions. It’s something like language in this regard; we contribute to it by our very interactions and behaviors, and we use it to communicate, to function, and to connect more frequently and strategically. In this way, data is something of a paradigm in that it affects (or has the potential to) nearly every domain, every industry, and every culture. I’ll spend a lot of time illustrating this and thinking about these examples against the backdrop I’ve outlined in my previous posts. I want to start with something simple, in the spirit of illumination: lightbulbs. Lightbulbs are one of those technologies that have largely remained stagnant since their early days. For all practical purposes, it remains a glass bulb containing material that glows as a result of electrons becoming excited—via the electric supply—and releasing extra energy in the form of light photons. It’s pretty binary, toggle it on or off and there you have it. There have been a couple of curious tweaks to turning the lights on over the years, namely dimmer switches and those wonderful things called Clappers. But, I digress. 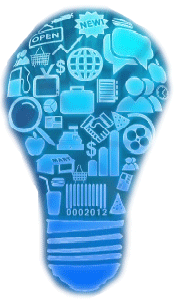 It is, perhaps ironically, the lightbulb which symbolizes ideation, that— today— is actually pretty dumb. Looking at the lightbulb of tomorrow— which is already on the market in a 1.0 version— is a “smart” lightbulb, relatively speaking anyway. Enter data. It’s an eco-friendly LED-powered bulb, implanted with a tiny silicon chip that inputs and outputs data to enable a level of “awareness” of its environment. It connects to the Internet, among other things. 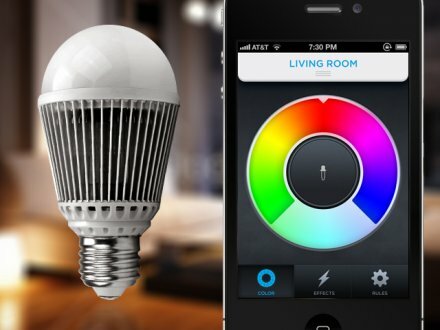 This lightbulb can detect motion and communicate with other bulbs to “follow” your movement, into the bathroom for example, and using its time sensor, it will adjust lighting to fit the time of day. No more pupil-burning middle-of-the-night bathroom runs! Its ability to interact with other devices opens an entirely new ecosystem of applications for lightbulbs, serving, for example, as a timer, an email notification system, an auto-mood setter, an energy-saver, a detector for lost items, and the list of current applications grows. Suddenly, a lightbulb becomes an integral component in other areas of life. The lightbulb now contributes to a broad range of day-to-day experiences and more efficient lifestyle management. Consider the lightbulb that helps regulate and conserve my home’s energy efficiency by communicating with other devices (think refrigerator, hot water, etc); the lightbulb that connects with my alarm systems to thwart burglars through timed lighting; the lightbulb that casts different hues on my boring white walls, that enhances the media experience. Our old friend, the lightbulb, has transformed—and our old binary, on-off relationship (pun intended), has also transformed. A lightbulb was never so interesting, was it? Recall the multi-disciplinary role in technology development, quoted in an earlier post from Wikipedia. That development and innovation draws from so many other fields is what drives its trajectory. Until now, the lightbulb has been a rather commoditized, shrug-worthy addition to the shopping cart. Harking back to our ancestors’ use of fire, candles, torches, etc., our concept of lighting has certainly evolved. But, I’d argue that the speed of conception is about to accelerate faster than ever.